These are the world's first 3D printed diatonic harmonica combs commercially available for a wide variety of models. 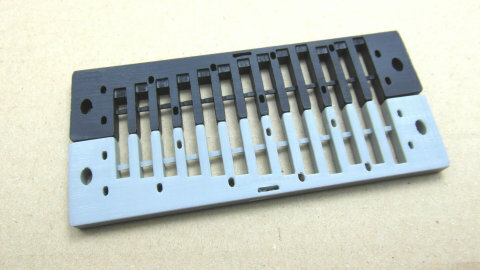 Made from the same ABS plastic used in factory injection-moulded harmonica combs, they are food-safe, tough and durable. 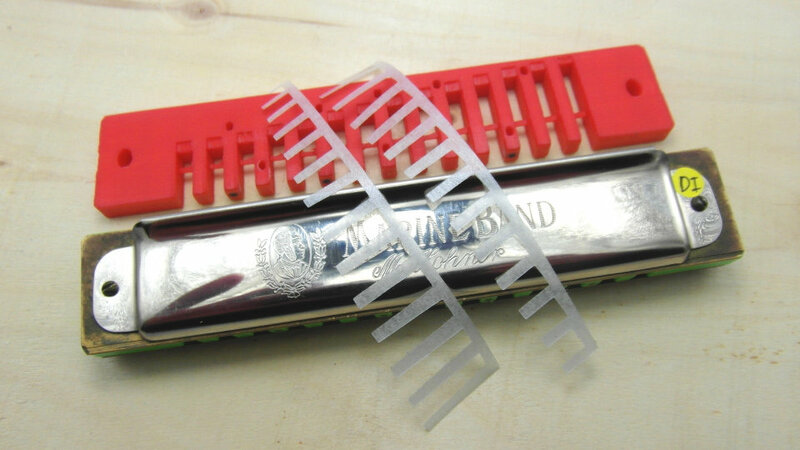 They're about the same weight as the equivalent Hohner pearwood comb, with a similar compressibility and sound. 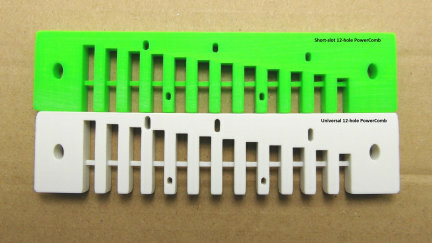 The rear and sides of the comb retain the 3D printed texture, but the front is finished to a smooth rounded surface for mouth comfort and speed. All stringed instruments have location markers in the form of white dots that allow players to orient themselves on the instrument with a quick glance. Now my LookDot adds this super-handy feature to diatonic harmonica combs, for the first time. 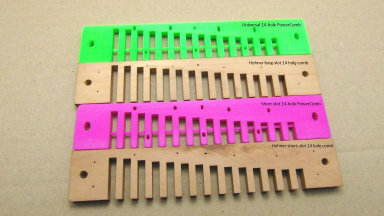 It's amazing how useful you will find this unique feature of my custom PowerCombs once you try it! For an extra fee, we can add your own name or a word of your choice on the right-hand end of my PowerCombs. There is not much space so the name you choose is restricted to 5 letters in UPPER CASE for legibility (if you're called Terence, choose TERRY instead!). 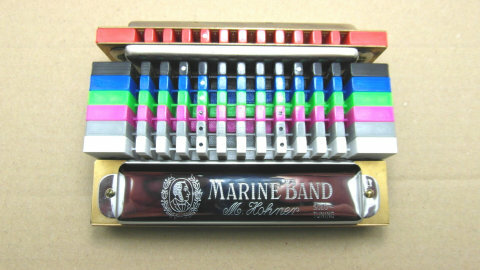 In 1980 I invented the half-valved harmonica, both diatonic and chromatic. 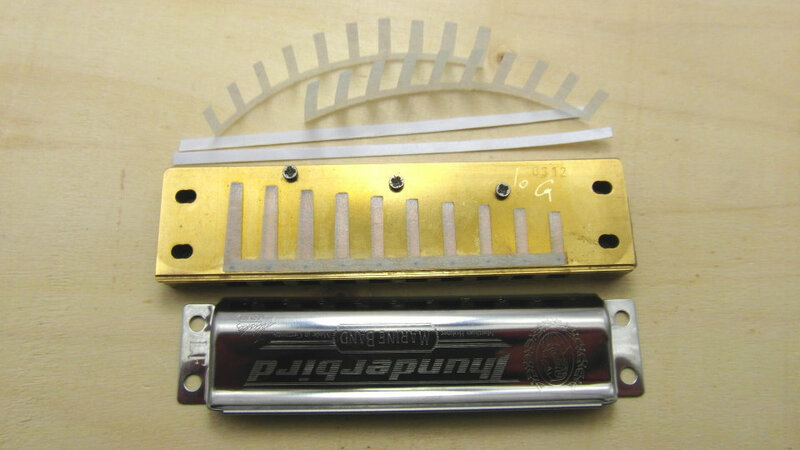 Half-valving allows bluesy interactive reed bending on the high notes in each hole whilst adding soulful valved bending expression on the low notes. 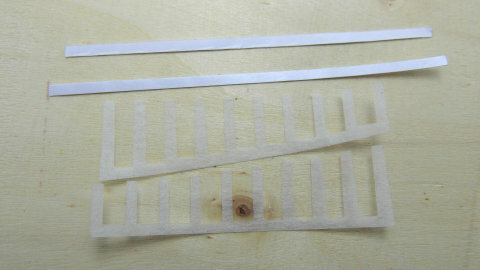 On a typical Richter harp, that means you can now add bending and vibrato to the blow notes holes 1-6 and draw notes holes 7-10. 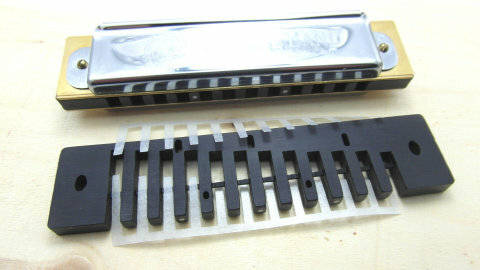 Increasing numbers of players are keen to try it, but most existing diatonic combs don't give enough room for adding valves. 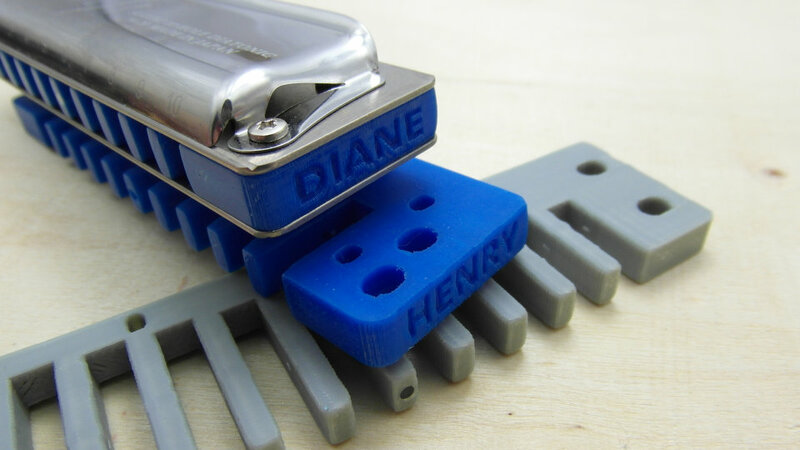 The integrated Valve Pockets at the rear of all chambers on my new PowerCombs allow you to add valves to your favourite harps with ease, in all 10 holes! Adding valves is perceived as tricky and fiddly - but it doesn't have to be! 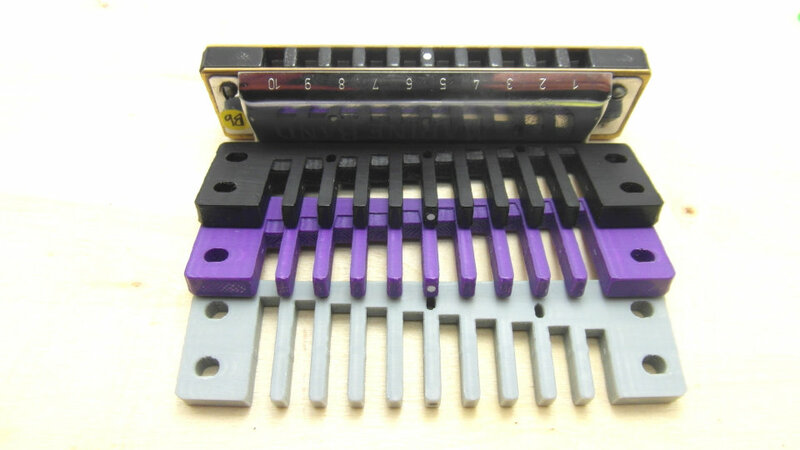 To allow more players to enjoy the benefits of half-valving, I've developed my own rugged Stealth-Valves, plus an easy way to add them to all popular harps with accuracy and confidence. Please go to the Valving page for more details and video instruction. If you order a Stealth-Valve Kit with your PowerComb, postage costs are reduced - so we can offer a lower price per kit. 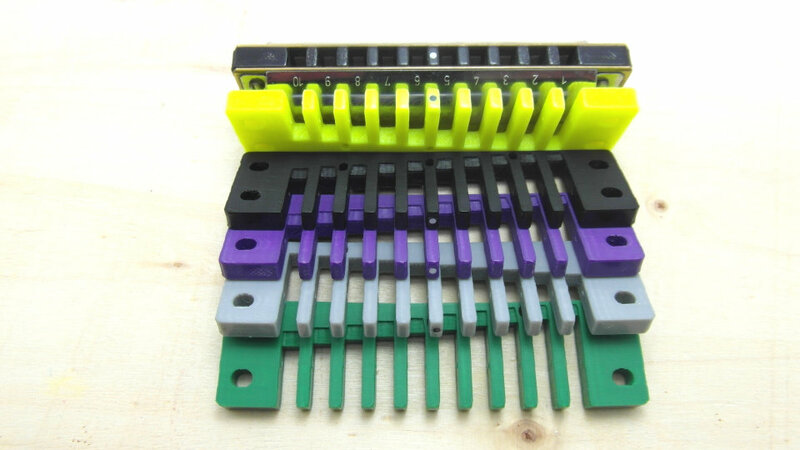 Slotted holes allow the player to assemble my PowerCombs to the front mouth feel they prefer, with the reedplates set either slightly back or forward. This is an innovation I first introduced in 2012 on the BMH30 X-Reed harmonica comb, and I'm happy to now include it on all my custom diatonic combs. 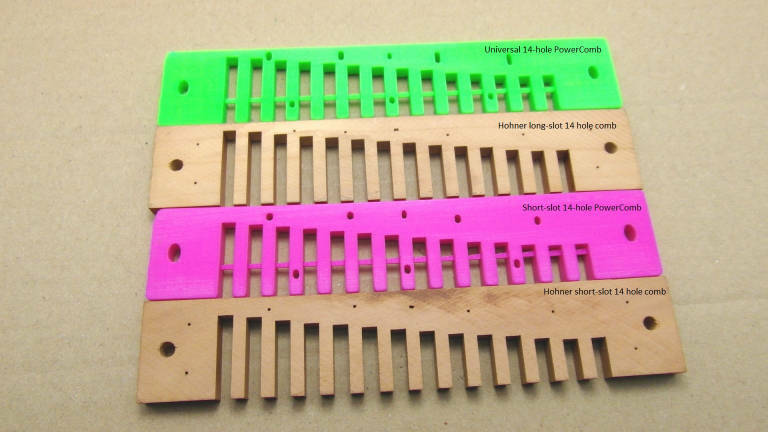 Like the traditional pearwood combs they replace, my 3D printed PowerCombs have a grain that runs along the length of the comb. As with a wood comb it is possible to break the tines off if you apply sideways pressure. To counteract the possibility of mishandling and add overall strength I've added a stabilising bar I call the Tuf-Strut, midway through the tines on the longer combs (Lucky 13 plus Hohner 12 & 14 hole models). Less than 1mm thick, it doesn't affect playability at all - but you can cut it out if you wish. 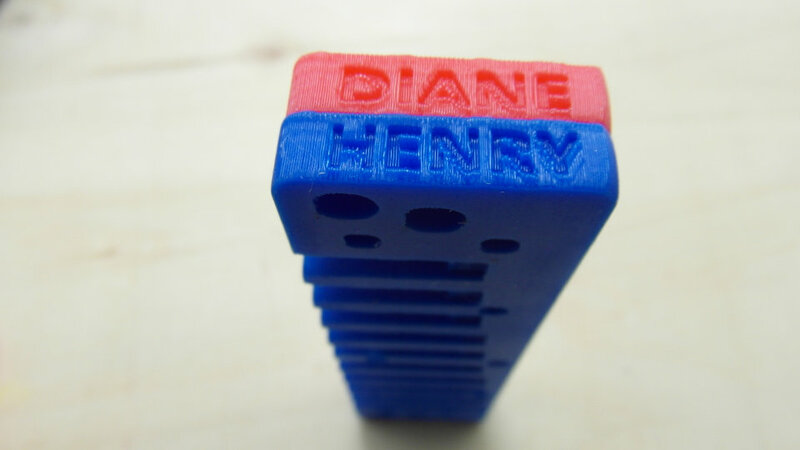 My combs are flat sanded in a 3 stage process on certified-flat granite blocks. 3D printing does impart a small curve to the combs, but they're flexible and will conform to the reedplate surfaces when assembled, for a perfect seal. You won't see any light gaps when you look through the rear of my combs. P.S. 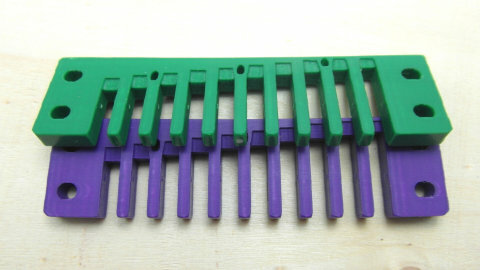 My PowerCombs work great without valves too! The 1896 Hohner Marine Band defined the look and tuning of the world's most popular instrument: the 10-hole diatonic harmonica. The original model is still produced largely unchanged, with nailed construction and raw pearwood comb. 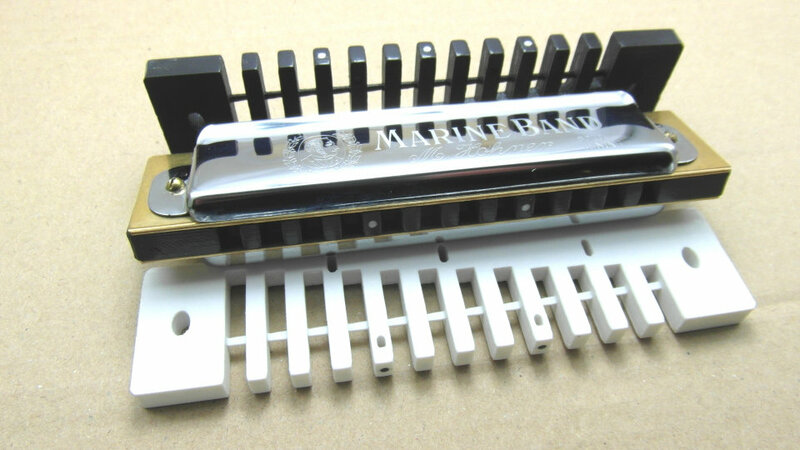 The most customised harp of all, it benefits greatly from a custom comb and conversion to screwed assembly. 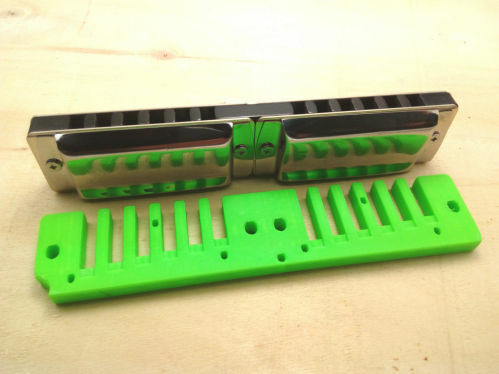 Now my 3D printed Hohner-10 PowerCombs add unique new features to this classic, like Valve Pockets, Personalised Name Option and the LookDot – plus 15 colours if you want them! 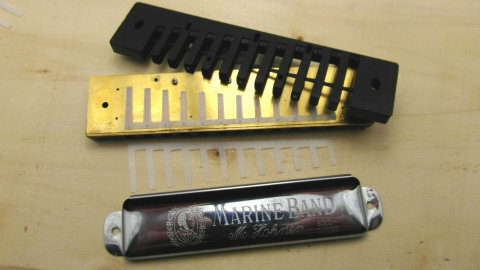 And the same comb fits the modern derivatives of the 1896 Marine Band: the Marine Band Deluxe, Crossover, and Thunderbird low-key range. 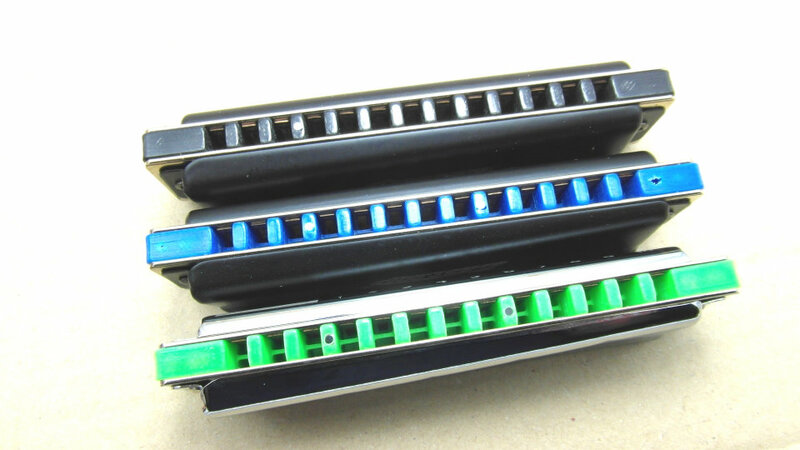 Because of the PowerComb's Valve Pockets, all these great Hohner diatonics can be easily valved with my new Stealth-Valves. This will give you a completely new sound on these beautiful Hohner diatonics – why not try for yourself? 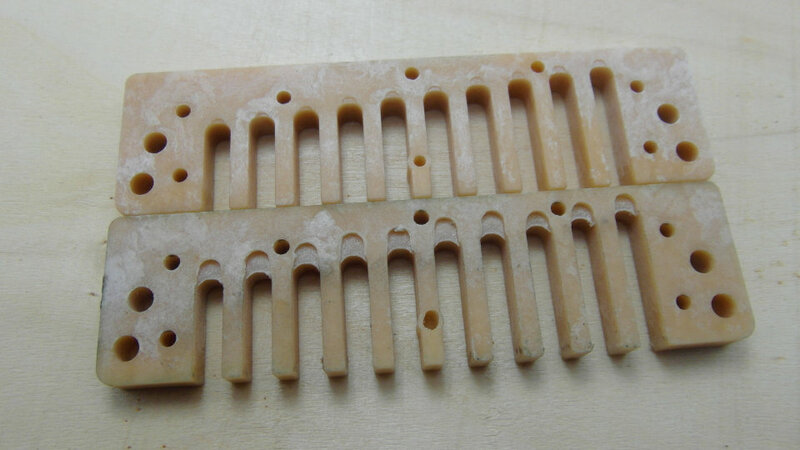 You can buy the combs finished and ready to fit, or save yourself quite a bit of money by doing it yourself. To see how, please watch the Sanding/Finishing video. The Sanding Jig will help you achieve even sanding using two combs at a time - this is how we do it; good results are guaranteed! Watch the Sanding Jig video to see how it's made and used. 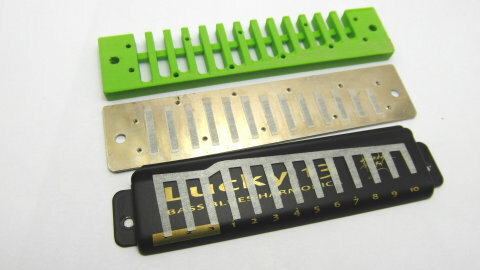 Suzuki 10-hole harps have earned an enviable reputation for hard-gigging reliability. 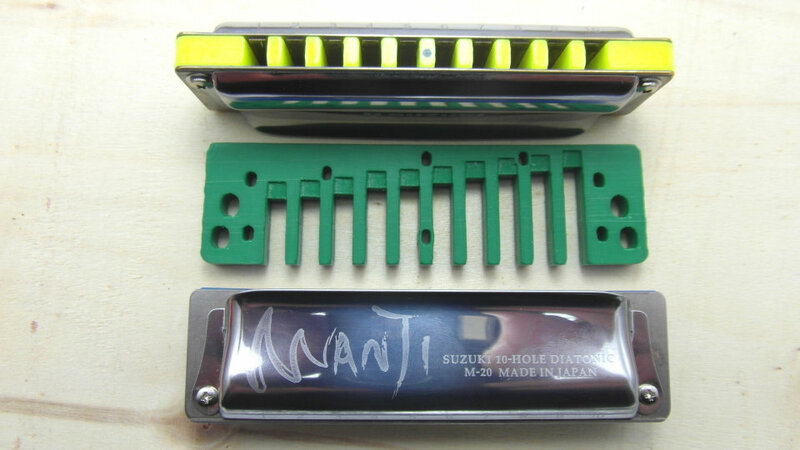 The first to introduce welded reeds, Suzuki is a leader in applying high-tech features to their harmonicas. For those who love Suzuki harps, my 3D printed PowerCombs add unique new features to their popular diatonic models - like Valve Pockets, Personalised Name Option and the LookDot – plus 15 colours if you want them! Because of the PowerComb's Valve Pockets, ALL Suzuki diatonics can be easily valved with my new Stealth-Valves. 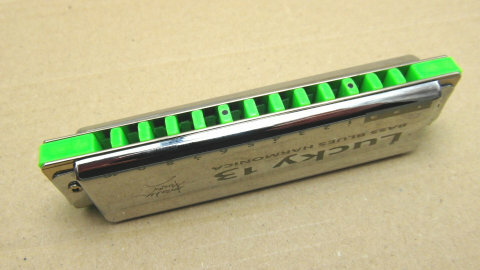 The Big Beasts of the diatonic harmonica world, Hohner's 12 and 14 hole models have a beautiful sound and extended range that appeals to many. However their raw pearwood combs tend to swell and warp, and the nailed construction does not help with disassembly. Both these factors make them less than user-friendly. 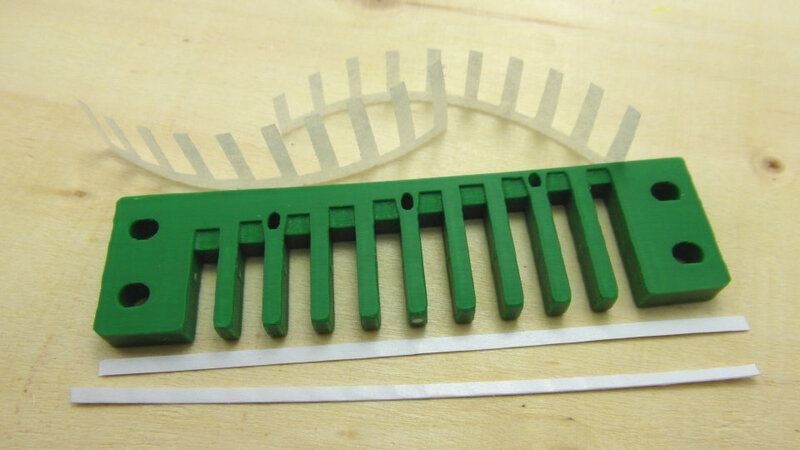 Now my 3D printed PowerCombs offer a way to revive those big Hohner diatonics mouldering away in your closet! 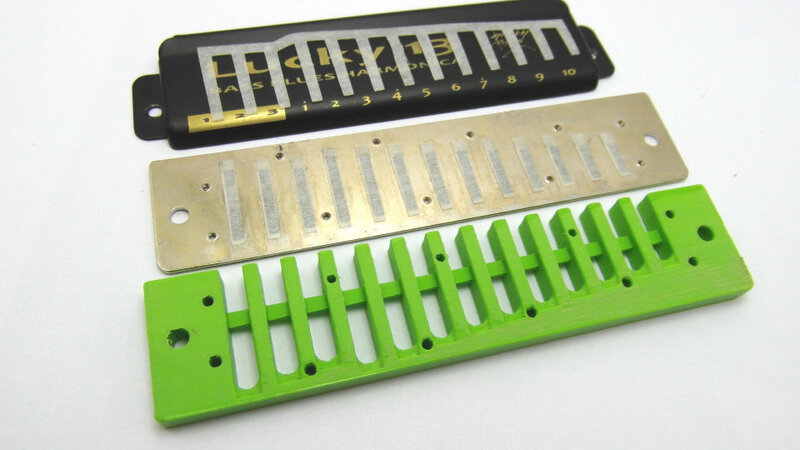 They are impervious to moisture, with smooth rounded fronts for comfortable playing and slotted screw holes front and rear for easy assembly and an airtight seal. 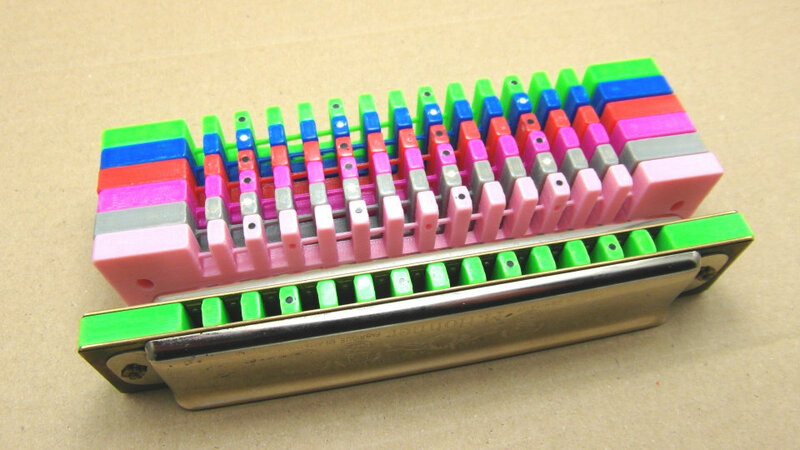 The big Hohner PowerCombs have Valve Pockets to allow easy valving with my new Stealth-Valves, a longitudinal Tuf-Strut for extra strength, come in 15 colours – and you can add your name to the treble end if you wish. My unique LookDot is the icing on the cake – several of them in fact! Spaced out at regular logical intervals, the LookDots will help you negotiate your way around confidently on all that frontal real estate. You'll quickly come to appreciate their value as soon as you start playing. 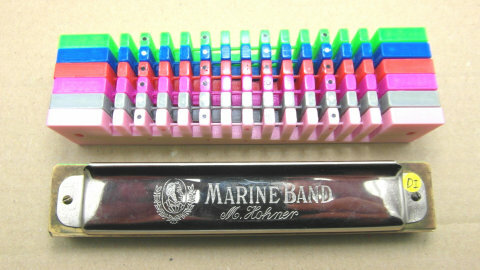 The big Hohner diatonics come in two reed sizes: long-slot (higher keys) and short-slot (lower keys). Unlike most other custom comb makers for these great old harps (who only offer one size comb), I've designed a Universal comb with long slots, and a Short-slot comb. This stays true to the original Hohner nailed wooden comb, which came in two slot lengths. 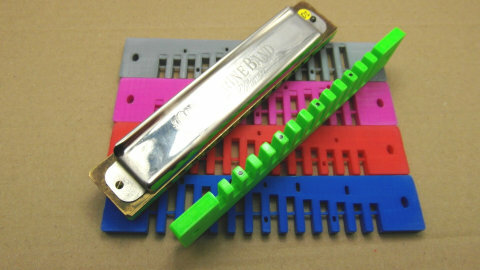 If you don't know what size your reeds are, choose the Universal PowerComb, as it will fit all. However if you have a higher-key harp with the short reeds, then choose the Short-slot as it will play more sweetly. You can see from the video the differences in reed sizes on these harps. I encourage you to remove the coverplates and check your harp before ordering. 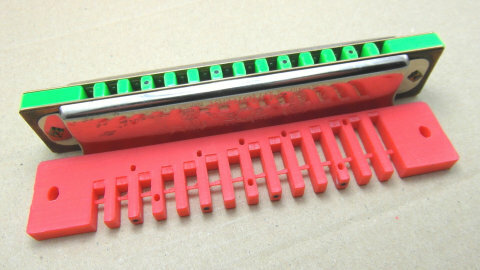 WARNING: long-slot reeds will NOT work on the short-slot comb. (You or a customiser will need to do the conversion from nailed to screwed fitting. Please use Hohner-size 1.6mm screws for fitting to my combs – fatter screws will require enlarging the screw holes). LUCKY 13 PowerCombs and Stealth-Valves! The Lucky 13 was released in August 2016, and has already gained many thousands of fans around the world. Exactly a year later the range was expanded to include Paddy Richter in C, G, D keys, plus PowerBender and Power Draw tunings in all 12 keys. 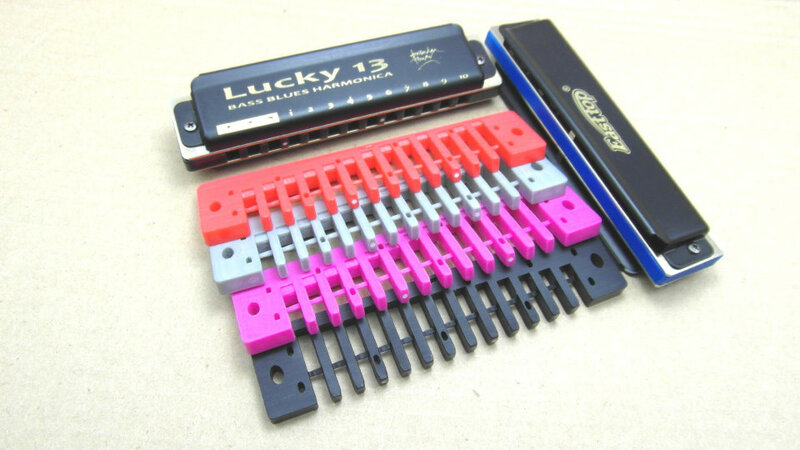 Hot on their heels are some exciting custom options for all Lucky 13 harmonicas: PowerCombs and Stealth-Valves. 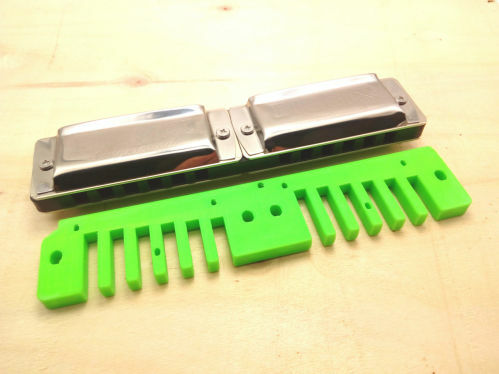 My 3d printed Lucky 13 PowerCombs add unique new features to this modern classic harmonica. 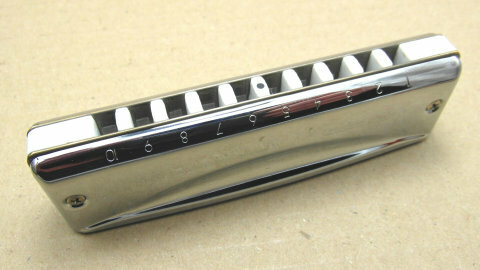 Hand-sanded and finished, they have smooth rounded fronts for comfortable playing, slotted screw holes front and rear for assembly to suit your preferred mouth feel, flat-sanded reedplate surfaces for an airtight seal, a Tuf-Strut for extra strength, Valve Pockets for hassle-free valving – and a Personalised Name Option. Because of the PowerComb's Valve Pockets, the Lucky 13 can be easily valved with my new Stealth-Valves. Half-valved setup is how I play my Luckies! 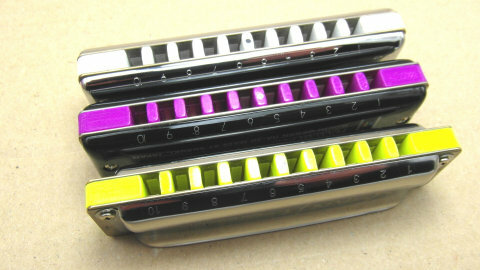 It allows you to keep all your bends but gives extra expression and volume on the low notes in each hole. My unique LookDot is the icing on the cake – two of them in fact! Inspired by the location dots on guitar necks, one is placed to mark the join between the normal low octave and extra-low range, while the other is between holes 5 & 6 of the standard range. The LookDots will help you negotiate your way around confidently on that bigger frontal real estate with ease - you'll quickly come to appreciate their value as soon as you start playing! A special video on valving the Lucky 13 is coming soon. In the meantime, see how easy it is here. 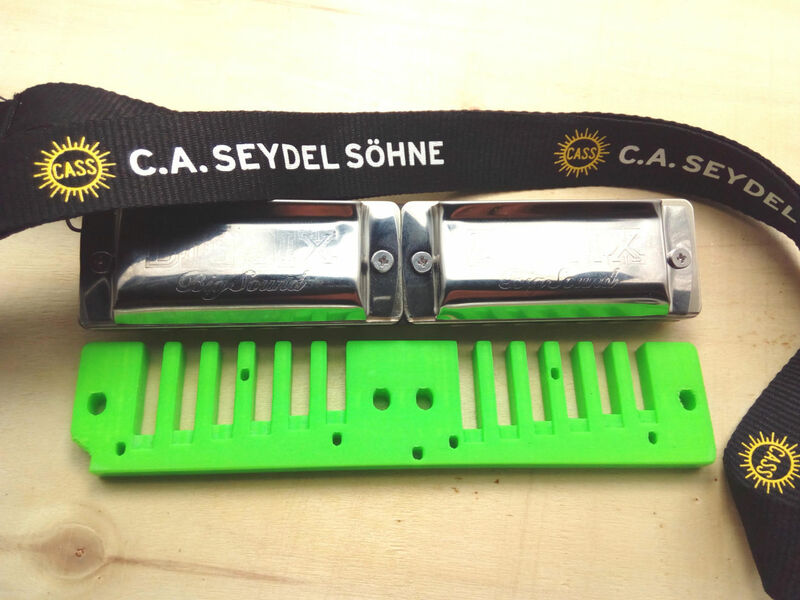 The Seydel Big Six is a popular model for players wanting just the main meat-and-potatoes lower 6 holes of a Richter harp. 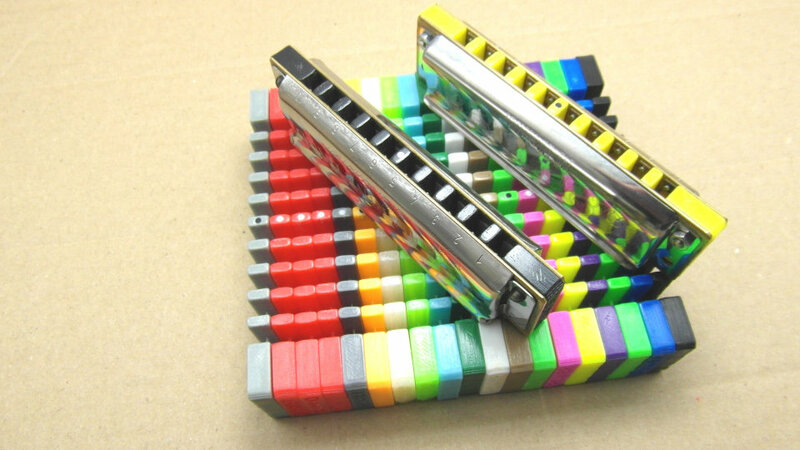 I recently had some enquiries from players who wanted to put two Big Sixes together on one comb to combine a couple of keys, or make a specialist chord harmonica. Having two Big Sixes on the same comb opens many possibilities, since each Big Six can be specially tuned in Seydel's Configurator. I liked the concept, so have created a 3D printed PowerComb to do the job! Like my other combs, it is valve-friendly, with each chamber having Valve Pockets so valves don't get pinched between comb and reedplates. You can either use Seydel's valves, or buy a Stealth-Valve kit from if you want to easily valve your Twin Big-Six yourself. 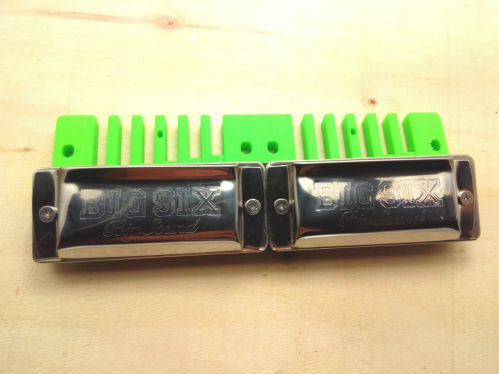 My Twin Big Six comb comes in a big range of colours, and you even have the option of having your own name imprinted on the side! 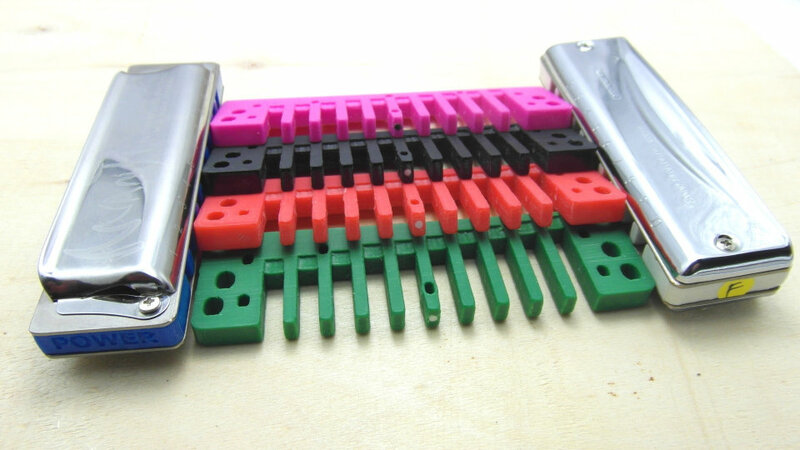 All you do is disassemble two Big-Sixes and put the parts straight on my double comb; they will fit perfectly! 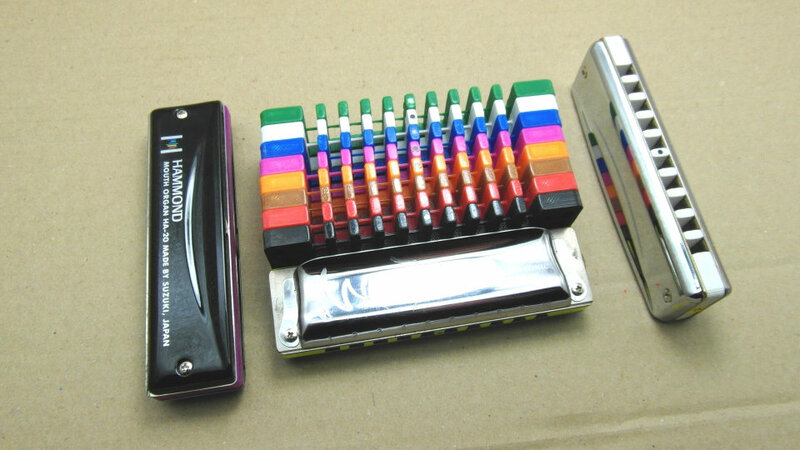 This new combo-harp offers a lot of new possibilities - why not think up some for yourself? I invented half-valving in 1980, and have played all my harps (diatonics and chromatics) that way ever since. Half-valving means that half the reeds in your harmonica are valve-affected - the low-pitched reeds in each chamber. That leaves the high-pitched reeds to bend as normal. Why do it? Because the low-pitched reeds on a standard un-valved harp are quieter and have no capacity for any expression: bending and vibrato are impossible on them. Half-valve your harp and suddenly those unresponsive reeds become full of soul! They are louder, purer in tone, and you can bend and add vibrato to the notes. Where you put the valves depends on the tuning. 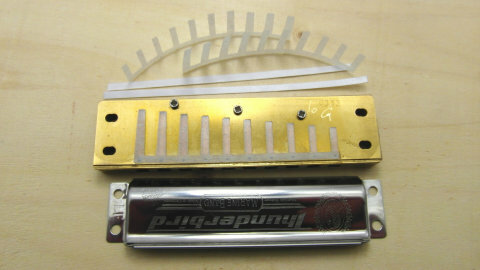 For a standard Richter harp you would add valves inside for the lower 6 reeds, and 4 valves outside. For PowerBender and PowerDraw, all the valves are inside and none on the outside. Adding valves is perceived as tricky and fiddly - but it doesn't have to be! 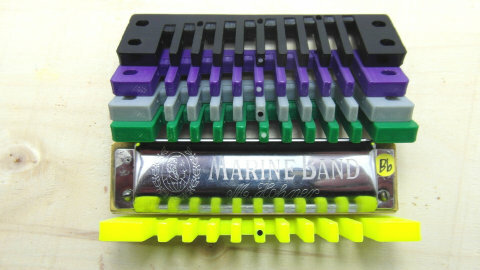 To allow more players to enjoy the benefits of half-valving, I've developed my own rugged Stealth-Valves, plus an easy way to add them to all popular harps with accuracy and confidence. Please check out the two videos showing how it works. 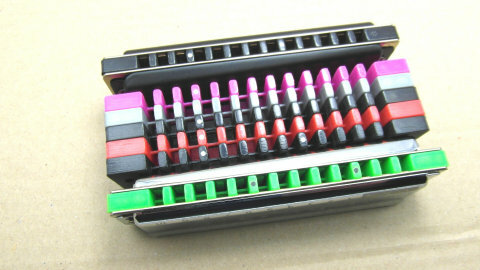 Video 1 shows full valving, 20 valves on a 10 hole harp. Video two shows half-valving on a Richter harp, plus fitting the reedplates to one of my PowerCombs with special Valve Pockets to give the valve bases plenty of room. The valve strips are precisely cut in the correct shape for each harmonica model. 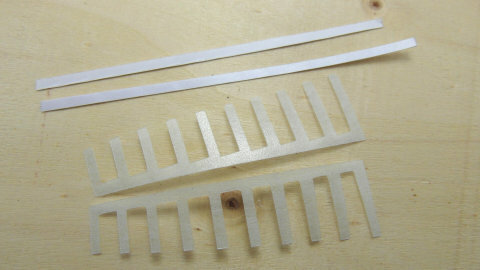 Laminated from two materials, they have a springy outer layer and a soft inner layer. 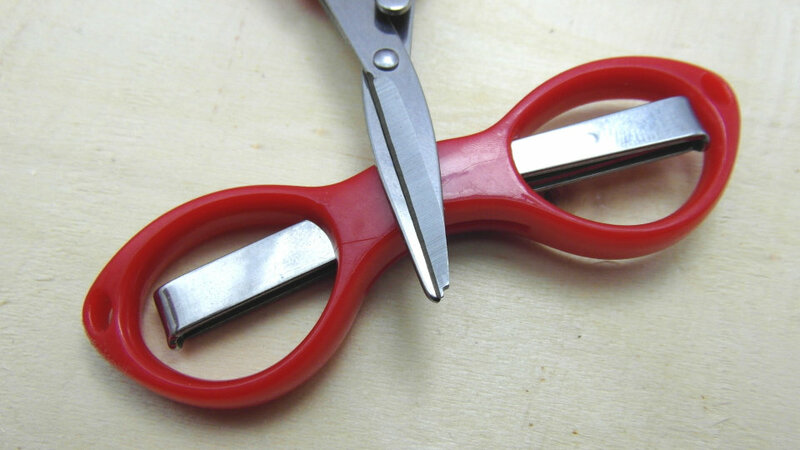 They are rugged, reliable, quiet and lay flat without sticking. Once fitted you'll forget they're inside your harp - hence the name Stealth-Valves. 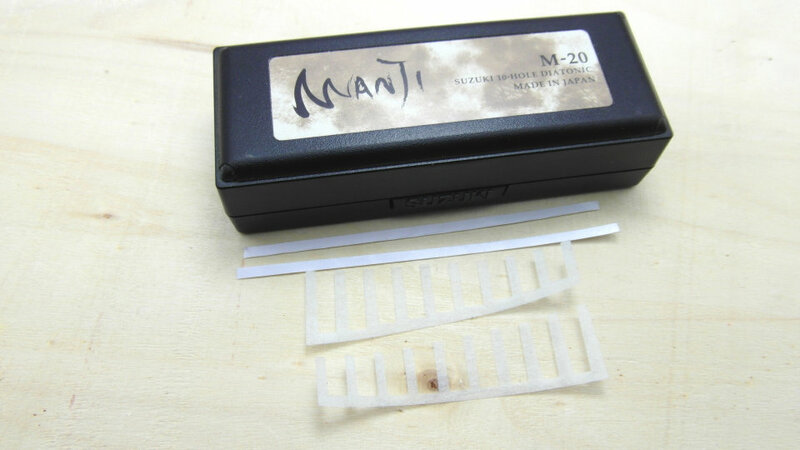 The Stealth-Valve Kit comes as two valve units, plus two adhesive strips, carefully packaged to keep everything flat. 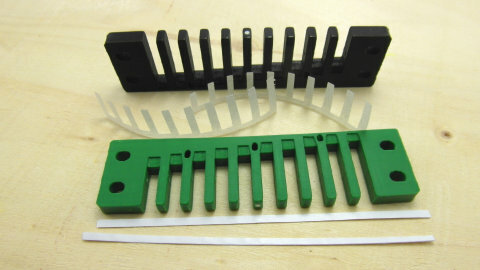 If you order a Stealth-Valve Kit with your PowerComb, postage costs are reduced - so we can offer a lower price per kit. 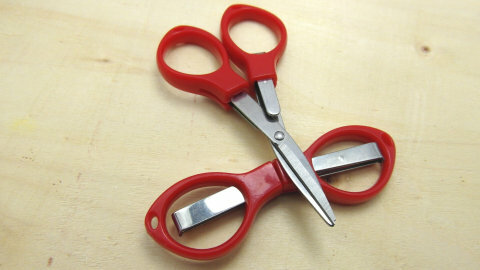 My notched Valve Scissors simplify and speed up accurate cutting of the installed valves to length, as shown in the videos. They can be ordered as an optional extra.